“Let’s play Chaton Canon again from measure 52,” Mrs. Barry said, as the band began playing Chanton Canon on her command. All the band students were on the stage, and Mrs. Barry was on her conductor podium, purposefully waving her baton. 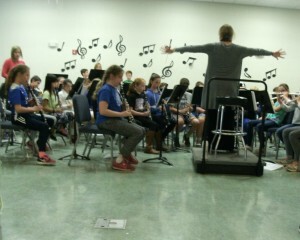 This was the one of the group practices of band before Arts Nights. 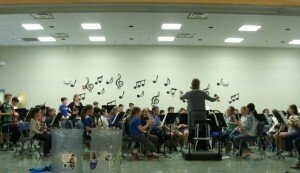 The whole cafeteria was practically vibrating with music. 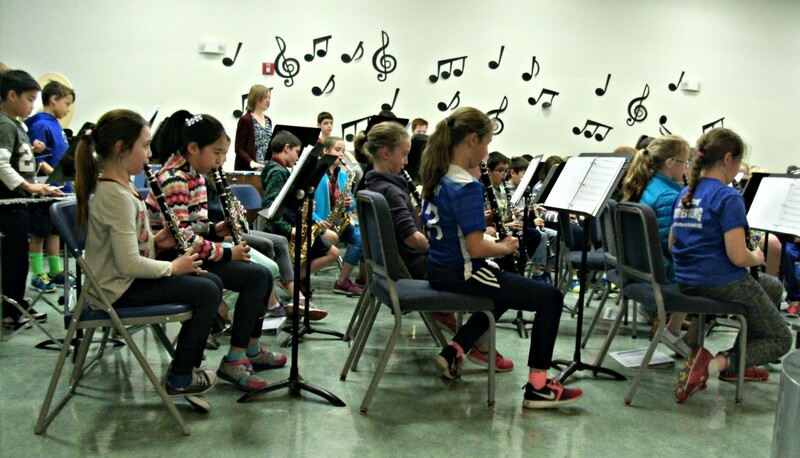 We wanted to find out more about the band at Chickering School. We had a fascinating chat with Mrs. Barry, and we also interviewed some band students, to learn information about homework, music, and the instruments. We thought it would be nice to know why Mrs.Barry wanted to do her job. Why did she chose to be a band teacher? She wanted “to follow in my mom’s footsteps.” Her mom was a music teacher. It can also be hard for a teacher, teaching a band. 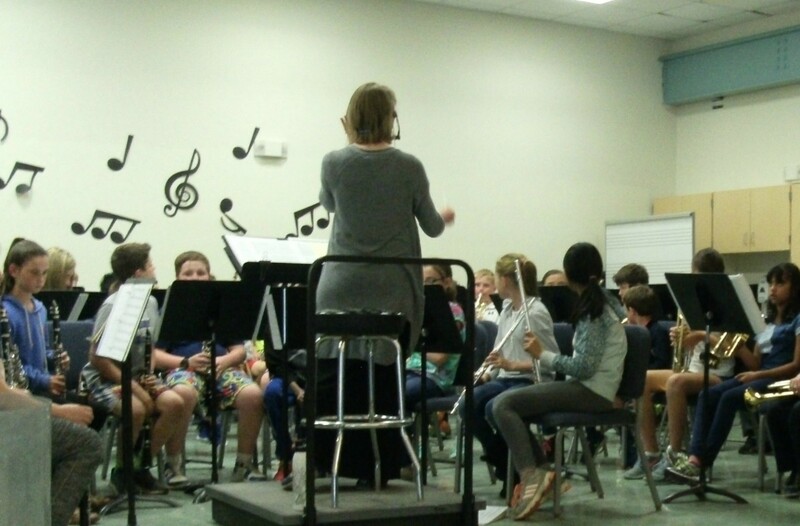 “What is the most challenging thing about being a band teacher?” we asked. “There are many different instruments, all instruments are different and I have to help them all. 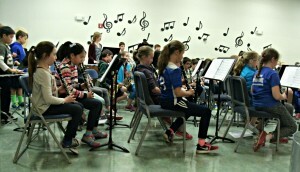 It is tricky to teach different instruments,” she said. 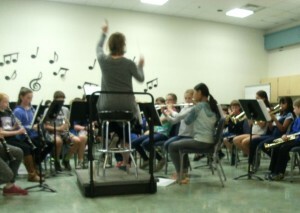 We wanted to find out why the students decided to play band. Did they have other music experience? 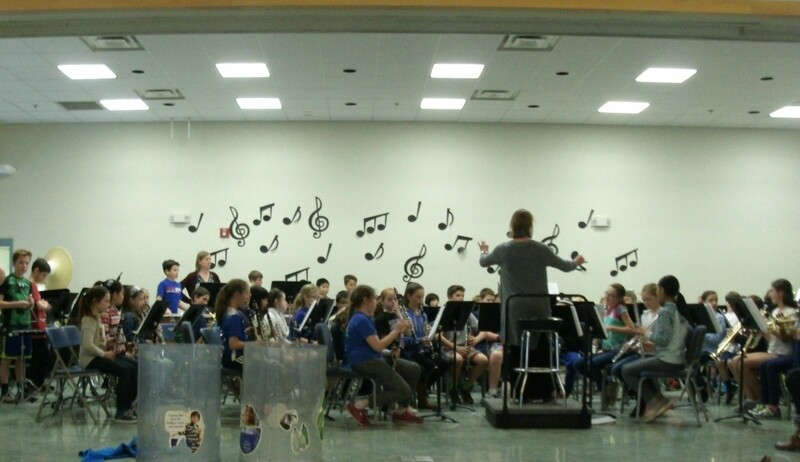 We interviewed 6 students, and we asked each of them why did they choose band. The six students were Jade, Erica, Abby D., Meredith, Grant, and Antonio. Antonio and Grant stated that they thought it would be fun to be able to learn and play an instrument. Neither of them had played an instrument before, except for learning the recorder in 3rd grade, which was part of the curriculum. Meredith wanted to contribute to the band, knowing she will be part of a team. Abby had never learned an instrument before, and saw the chance of knowing what it was like by joining the 4th grade band. Erica noted that she had played the recorder in 3rd grade like everyone else, but she wanted to learn another instrument. Jade already played the piano, and she knew from experience that learning a new instrument was cool and exciting, while she didn’t know what being reporter was like, which was the other option. Everyone choose band for a different reason, but now we are left with another question. What instrument did they choose, why did they choose that instrument, and is that instrument hard to play? Jade and Abby plays the clarinet. Jade thinks that the clarinet is hard to assemble, and that after a while, she runs out of air so it is hard to make a sound. Abby doesn’t really think that the instrument is really hard. Grant plays the trumpet, and he explained that the trumpet is a low instrument, and so it is hard to play high notes. Antonio plays the trombone, and he choose the instrument because it look fun to play. He also noted that it is not hard to play. Meredith plays the saxophone. “Because it was similar to the recorder,” Meredith said “It is not hard to play.” Erica plays the flute, because her grandmother had also played the flute, and so she followed her grandmother’s footsteps. She said that at first, it was hard to get your mouth into the right position, but later, it became easier. We wanted to learn about the band student’s favorite piece, and genre of music. Everyone answered Chanton Canon, and Let’s Go Band, which will be played at Art’s Night. Most people liked Pop music, and a couple liked Country music. We learned so much about the band. As reporters, we didn’t know anything about band, and what it was like to be playing an instrument in a group. It was also fun to watch the team play together, practicing for Art’s Night. 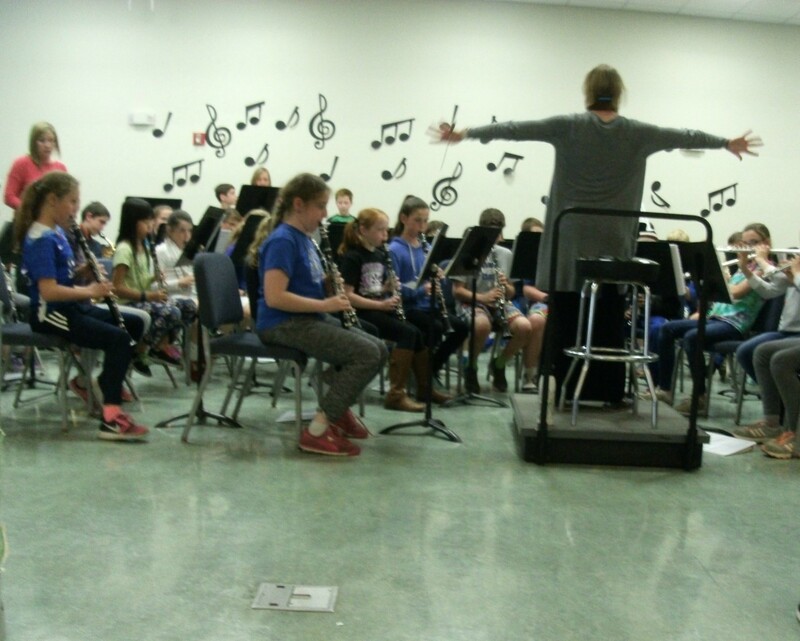 We had wondered what it was like to be in band, and by interviewing some band students, we were able to find out some ideas about what band students thought about band. Reported by: Valentina, Makenna and Alexander R.
This entry was posted in Grade 4 and tagged 4th grade, band, instruments. Bookmark the permalink. This is a comprehensive interview about the Chickering Band. I liked how you included so much information from the six people you interviewed. I wonder if Band students want to learn more about Reporters?